NEFilk logo by Matt Leger. 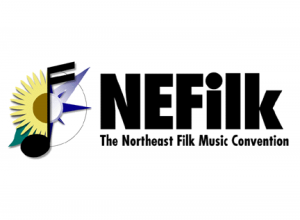 “The Floating Northeast Filk Cons Past,” in the ConCertino 99 program book. Other sources include past program books, MASSFILC records, and my own memory. ConCerto, June 8-10, 1990, Cherry Hill, NJ. US, and initiated a number of traditions for later conventions in the series, including the songbook within the program book. Notes: When plans for another ConCerto in New Jersey fell through, Spencer convinced M.A.S.S. F.I.L.C. (now MASSFILC) to plan a convention in New England, starting from scratch in February. The name means “a small concerto.” This was the first convention in the series to have an Interfilk guest and a listener guest. program book was Pete Seeger. donor, but Cynthia was unable to attend due to illness. rotation, was cancelled with a year’s notice, so Conglomeration filled in the gap. instead of the usual songbook. (at whose concert Tom was injured) MC’ed the benefit concert for Tom Smith. before the convention. A limited-edition CD, prepared by Harold Stein, was distributed to convention guests and premier members. Note: The Bakers were unable to attend due to a death in the family. ConCerto: Conventions held in the New Jersey suburbs of Philadelphia. No permanent organization is associated with ConCerto. organized by New York Metropolitan Filk Organization. Conterpoint: Conventions held in the Baltimore / D.C. area. The first one received organizational backing from MASSFILC; Conglomeration was formed to organize subsequent conventions.